Understanding is shrouded by the passage of more than a century, but it is still difficult to figure out what the St. Louis Cardinals saw in minor-league outfielder Ody Abbott. During five professional seasons, Abbott had established himself as a capable fly-catcher, but had proved unable to hit even Class C-level pitching. Still, in August 1910 the Cardinals extracted Abbott from the Ohio-Pennsylvania League and afforded him a 22-game audition in their lineup. Predictably, he flopped, batting an anemic .186 with 20 strikeouts. Abbott then resumed play as a mediocre minor leaguer until he left the game in 1914. In sum, he simply was not a major-league-caliber ballplayer, his stint with the Cardinals notwithstanding. Baseball statistics, however, are hardly the only measure of a man, and Ody Abbott led a useful and productive life. He was among the first western Pennsylvanians to heed the call to arms in 1917, and served honorably during World War I. Thereafter, he became involved in local politics, eventually winning election as county sheriff. Abbott was still in law enforcement when his health began to fail in the early 1930s. He died of pneumonia and complications of heart disease at age 46, with the throng of local dignitaries, government officials, and fellow citizens who attended his funeral attesting to the esteem in which the deceased was held by those who knew him. 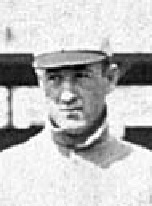 Early August of 1910 found Abbott in familiar surrounds, holding down an outfield berth for New Castle. Approaching age 24, he was showing modest improvement with the stick, his batting average standing at .250 – he had hit .208 and .231 the previous two seasons – with 27 extra-base hits in 105 games. But this uptick in offensive performance had been achieved against Class C minor-league pitching. On their face, therefore, Abbott’s numbers afford no reason why he would be considered a major-league prospect. Nevertheless, on August 8, 1910, his contract was purchased from New Castle by the National League St. Louis Cardinals.17 He reported at the close of the Ohio-Pennsylvania League schedule nursing a sprained ankle suffered in late-season play and spent his first week in St. Louis on the bench. By then, the Cardinals were headed for a seventh-place (63-90) finish and ready to try out new talent. Back in Monongahela for the winter, Abbott sent word that he was “going to show the [Oakland] fans just how good I really am. I have taken off weight and am sure that I will make the team.”28 In limited early-season opportunities, Abbott hit a respectable .289 (11-for-38) in 14 games. But he was among those released by Oakland on roster cutdown day in early May.29 Within days, however, he was re-employed, signed by the San Jose Bears of the Class D California League. In 104 games with San Jose, Abbott batted .249.30 The following season, he was re-engaged – improbably – by Tacoma, and was batting .271 in 61 games when released in early July.31 Abbott then completed his career in Organized Baseball with a 65-game tour with the Regina Red Sox in the remote Class D Western Canada League, where he batted .277 with 15 extra-base hits. Upon returning home, Ody resumed playing ball for Monongahela City, and would thereafter play in local old-timers-type games into his late 30s. He also became a member of various civic and fraternal organizations, and active in local Republican Party politics. In 1921 his efforts on behalf of the re-election campaign of a friend, Washington County Sheriff Alex Gary, were rewarded with appointment to the post of deputy sheriff. And when the new county jail was completed, Abbott was selected as warden by the local prison board.35 Following Gray’s death, Abbott threw his hat into the ring and emerged victorious in the Republican primary for county sheriff. He then won a hotly contested general election in November 1925. A fanciful essay recently posted online imagines Sheriff Abbott busy locking up bootleggers and having other Prohibition Era adventures.36 But his official duties were actually quite tame: courthouse security, transportation of prisoners, serving process, and other mundane legal chores. His remains were transported home where funeral services were conducted from the Hotel Abbott by the Reverend W.F. Bayle of the local Episcopal Church and produced “one of the largest [requiems] in the history of the district. … Attendees included former classmates from school and college, fellow athletes and political leaders.”40 Interment with full military honors at Monongahela Cemetery followed. Originally one of 10 Abbott children, he was survived by only his brothers James and Joseph. Sources for the biographical detail recited herein include material in the Ody Abbott file at the Giamatti Research Center, National Baseball Hall of Fame and Museum, Cooperstown, New York; US Census, city directory, and Abbott family data accessed via Ancestry.com; and various of the newspaper articles cited below, particularly the extensive and personal information-rich obituaries published in the Charleroi (Pennsylvania) Mail and Monongahela (Pennsylvania) Republican, April 14, 1933. Unless otherwise noted, stats have been taken from Baseball-Reference. 1 Riverview was renamed and incorporated as the borough of New Eagle in September 1912. 2 The other Abbott children were James (born 1871), Addison (1872), Mayme (Mary Anna, 1874), Margaret (1876), John (1878), Edward (1881), Joseph (1882), Charlotte (1892), and Elijah (c.1893). All but Elijah survived childhood, but none of the Abbotts lived particularly long lives, with Jim, Mayme, and Joe being the only ones to reach age 50. 3 As per the account of funeral services published in the Monongahela (Pennsylvania) Republican, April 17, 1933. 4 As noted in various editions of The Pandora, the Washington & Jefferson yearbook. Baseball reference works improbably list Abbott as 6-feet-2, 180 pounds, a stature belied by photographic evidence establishing that Abbott was a much smaller man. See, e.g., photos in the Bullpen section in the Baseball-Reference entry for Abbott. 5-feet-9, 165 pounds is the Abbott size listed in the lineups for the Princeton v. Washington & Jefferson football game of October 1907. See the Philadelphia Inquirer, October 19, 1907. Already a professional baseball player by the time he entered Washington & Jefferson, Abbott was never a member of the W&J College nine. 5 As reported in the Philadelphia Inquirer, November 29, 1907. 6 As reported in the Philadelphia Inquirer, October 18, 1908. 7 Only traces of Abbott’s time at Washington & Jefferson survive in the school’s Learned T. Bulman Historic Archives and Museum. College catalogs list Abbott as a member of the Class of 1910, but he was not named as a graduate in the 1910 commencement program. Rather, he largely drops from school records after 1908, per email of Allyssa Yanniello, U. Grant Miller Library, Washington & Jefferson College, to the writer, February 14, 2017. 8 According to the Ody Abbott obituary published in the Monongahela Republican, April 14, 1933. 10 Based upon a posthumous player questionnaire completed in 1962 by nephew and namesake Ody Abbott Dickey, our subject is currently listed as a right-handed batter and thrower in modern baseball reference works. But Abbott’s playing career was over before Dickey (1916-1997) was born, and Dickey conceded a sketchy understanding of his uncle’s playing attributes in the questionnaire cover letter to Hall of Fame historian Lee Allen. More important, a photograph published in the Tacoma (Washington) News, June 24, 1911, provides incontrovertible evidence that Abbott was a lefty batter. As for his throwing arm, the historical record is silent, but the fact that a good athlete like Abbott never played as much as a single game at a right-handed position like infielder or catcher during his nine-season pro career supports the suspicion that he threw lefty, as well. In any event, efforts to correct various errors in Abbott reference work listings were ongoing when this bio was submitted. 11 As per the Philadelphia Inquirer, January 12, 1906. 12 As reported in Sporting Life, September 29 and October 6, 1906. 13 As per final Ohio-Pennsylvania League stats published in the Cleveland Plain Dealer, November 24, 1907, and Sporting Life, January 4, 1908. 14 As reported in Sporting Life, January 25, 1908, and (Jersey City) Jersey Journal, February 1, 1908. 15 As per the Jersey Journal, February 26, 1908, and Sporting Life, March 28, 1908. 16 George Chip reigned as world middleweight boxing champ from October 1913 to April 1914. An inspirational letter to Chip from Ody Abbott at Camp Sherman in Chillicothe, Ohio, was later published in the New Castle (Pennsylvania) News, September 18, 1917. 17 As reported in the Boston Journal and Canton (Ohio) Repository, August 9, 1910, and Sporting Life, August 13, 1910. 18 Sporting Life, January 7, 1911. 19 As per Sporting Life, October 8, 1910. 20 As reported in the Fort Worth Star-Telegram, April 24, 1911, and Sporting Life, May 6, 1911. Tacoma reportedly paid $2,500 for Abbott, pitcher Ed Higgins, and infielder Pete Morse. 21 As reported in the (Portland) Oregonian, July 17, 1911. 22 As reported in the Washington (DC) Star, February 9, 1912, Frederick (Maryland) Evening Post and Olean (New York) Evening Times, February 27, 1912, and elsewhere. 23 As reported in the Oregonian, San Diego Union, and Seattle Times, July 19, 1912. 24 Per Sporting Life, August 3, 1912. 25 Seattle Times, July 19, 1912. 26 As reported in the Seattle Times, July 29, 1912, and Sporting Life, August 24, 1912. 27 As per Sporting Life, December 9, 1912. 28 As per the Oakland Tribune, January 26, 1913. Reportedly, when he reported from the Northwestern League in midseason 1912, Abbott was “fat and could not get into condition” for Oakland. See the Oakland Tribune, February 24, 1913. 29 As reported in Sporting Life, May 13, 1913. 30 As per the 1914 Reach Guide, 504. Baseball-Reference has no record of Abbott playing for San Jose, but his identity is confirmed by express mention of Ody Abbott in San Jose game accounts published in the local press. See, e.g., the San Jose Mercury News, May 18 and August 3, 1913. 31 Abbott’s release by Tacoma was reported in Sporting Life, July 11, 1914. Baseball-Reference has no 1914 Tacoma listing for Abbott, but his stats with the Tigers that season were published in the 1915 Reach Guide, 199. 32 According to the letterhead on Monongahela Baseball Club stationery. 33 In most Army units, the first [or top] sergeant is the highest-ranking noncommissioned officer, and charged with maintaining order and discipline in the ranks. 34 As noted in the Abbott obituaries published in the Charleroi Mail and Monongahela Republican, April 14, 1933. 35 As reported in the Charleroi Mail, March 9, 1923. 36 See “Ody Abbott: In the Still of the Night … or Something,” posted on the Great Names in Baseball blogspot, September 26, 2011. 37 Per the Charleroi Mail, January 9, 1930. 38 As per the Charleroi Mail, April 14, 1933. 40 Per the Monongahela Republican, April 17, 1933.